When it comes to preventing breast cancer, the best defense is early detection. We ensure patients receive the most advanced care available to diagnose and treat cancer at its earliest and most curable stages. Women or men with a personal or family history of cancer may benefit from meeting with our board-certified genetic counselor to assess their risk for hereditary cancer. Assessment may include genetic testing for BRCA 1/ BRCA 2 and other genes associated with hereditary breast cancer. For information, click here or call 941-917-2005. To schedule a mammogram or other breast-imaging test, call 941-917-7322. If you are facing a possible breast cancer diagnosis, or have been recently diagnosed with a new or recurring cancer, call our Breast Health Navigators at 941-917-3377. 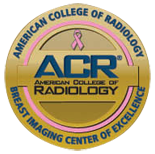 The American College of Radiology designated Sarasota Memorial a Gold Standard Breast Imaging Center of Excellence. Sarasota Memorial's Breast Health Center is a Certified Quality Breast Center of Excellence, as designated by the National Quality Measures for Breast Centers (NQMBC) program, placing it among an elite group of facilities recognized for continued commitment to providing quality breast care and reaching a level of national excellence.